In order to help mobile advertisers drive higher retention and LTV, we’re continuing on our course as format leaders in our industry, and are happy to announce that Remerge is now offering playable ads for app retargeting - the most engaging ad experience on the market. Advertisers can now leverage a variety of ad formats including native, dynamic, video and now playables to re-engage their high-value users and maximize in-app revenues. Optimized for engagement, the ads are designed to be played and interacted with, allowing users to experience a snippet of your app within a rich media banner. A call to action displayed within the ad or in an end card encourages the user to either reinstall or re-engage with the app. In the most recent App Install Marketing Survey, AdColony reported that playable usage has risen to almost 64% - up from just 33% last year and it’s easy to see why: The CTR for playables is on average 3-times higher than for standard video ads with interactive ads driving up to 4x higher conversions than interstitials. 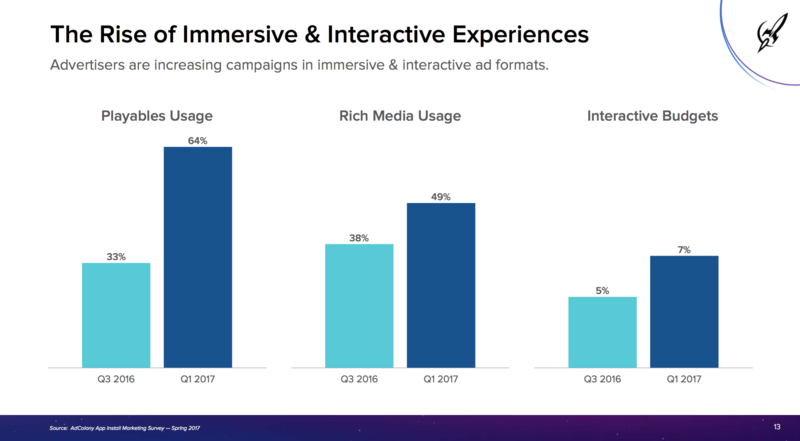 As well as driving great results for advertisers, a survey from The NewBase reported playables to be the most widely accepted and enjoyable ad experience for users, with 91% of users describing playables as fun and 32% of users saying they would be more likely to consider a purchase after seeing an interactive mobile ad. As more and more time is being spent on mobile and within apps, users have come to expect a more engaging and entertaining ad experience. With playables, advertisers have the opportunity to create a more memorable interaction with users, and the users in turn get higher quality, tailored content with offers and features relevant to them and their interests. And although playables are often associated with gaming apps, apps of all verticals can leverage the format to create a better more engaging ad experience. We believe that this innovative solution will improve the user experience and create a more meaningful touchpoint between a brand and its users and we’re happy to be bringing this interactive solution to your app retargeting campaigns.